• 5mm (~0.2”) low profile and 100mm (~3.9”) diameter small footprint. • Same dimensions as our popular three LED aluminum Neptune Light. 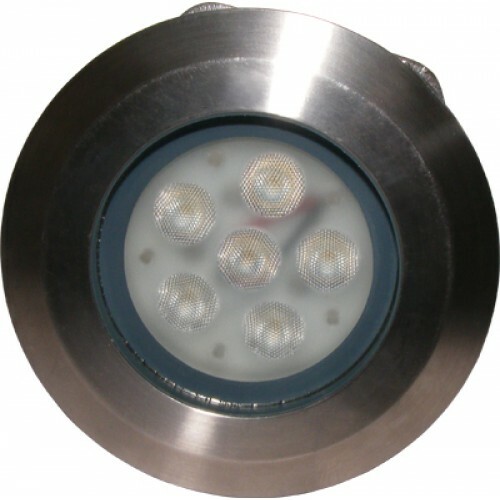 • Six state-of-the-art 3W, US made, high-quality, high-power LEDs provide the most lumens per watt in LED technology. • High-intensity LED light travels farther underwater for maximum visibility and truer colors. • Instant on, no warm-up of bulb needed. • SAE 316L stainless steel unibody. • Long service life, shock proof, ultra-rugged with no filament to burn out or break. 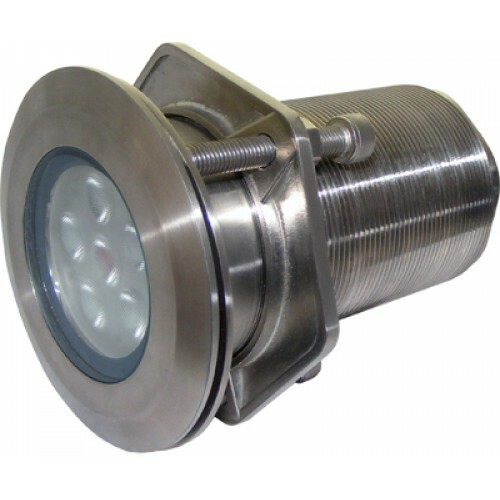 • No anodes required, as housing is corrosion proof. • Multi-voltage 12 VDC or 24 VDC. • Input Voltage Range: 11-35VDC (2A @ 12VDC). • Max Input Power: 25W. • Under Voltage and Voltage Spike Protected. • Electrically Protected Against RFI/EMC Interference. • Lens Material: 10mm tempered glass. • Mechanical Connection: Requires one 68mm (~2 11/16") dia. hole. • Maximum Hull Thickness: < 100mm (~3.9”).